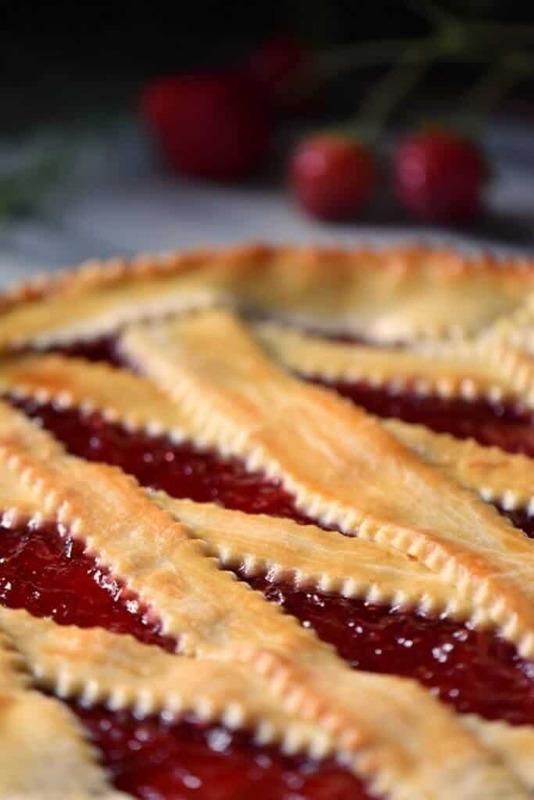 Home » Desserts » Italian Jam Tart -Crostata di Marmellata without butter! Do you like easy Italian desserts? If you do, you are going to love this Italian Jam Tart! The pasta frolla used to make this Crostata di Marmellata is made without butter and it still tastes amazing! It has often been said that the basis of Italian cooking and baking is using simple, quality ingredients and methods. This will often result in an end product that is nothing short of spectacular. There’s no shortage of easy Italian desserts to demonstrate this. Take, for example, ricotta cheese. What can be easier than whipping up ricotta cheese, to the point where all traces of graininess has been removed? When this whipped ricotta is layered, say for example, with juicy macerated strawberries, you have made a simple strawberry ricotta parfait -the perfect no bake dessert for summer or any time of the year. So, as you can see, simplicity and Italian desserts go hand in hand. 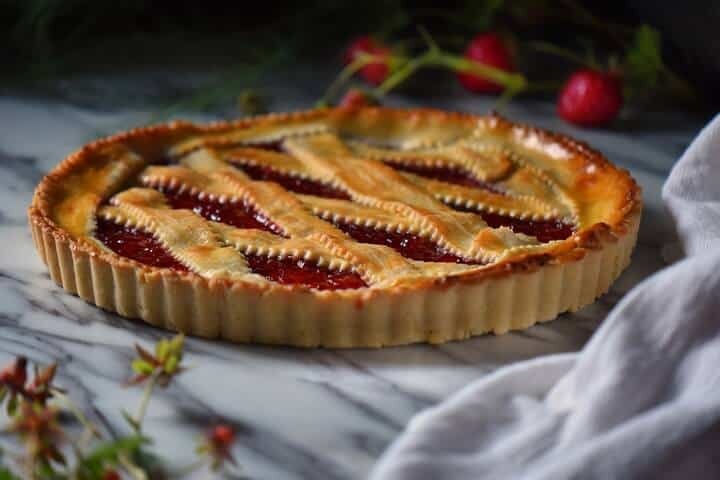 Today, I would like to share another simple dessert and possibly one of the most popular pies in Italy – Crostata di Marmellata. What is the secret to making the best crostata? There are not one, but two secrets to making the best Crostata di Marmellata. The first secret is using the best quality jam (or fruit preserves) you can find. Whether this is homemade or commercial -it has to have the right amount of sweetness to balance the overall flavors of the tart. As you can see, I have decided to use my strawberry jam as a filling for this Italian jam tart. There are no limits as to the kind of fruit preserves you can use -plums, peaches, cherries, apricots, figs, etc… all of these and more would just be spectacular. 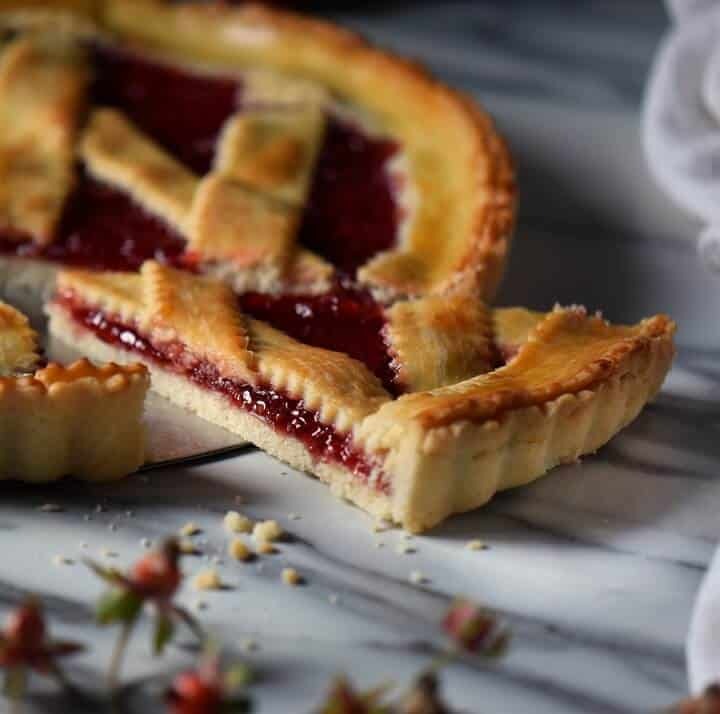 Nicoletta over at SugarLoveSpices has decided to use chestnut jam as a filling for her crostata. The second secret is the ratio of crust to jam. 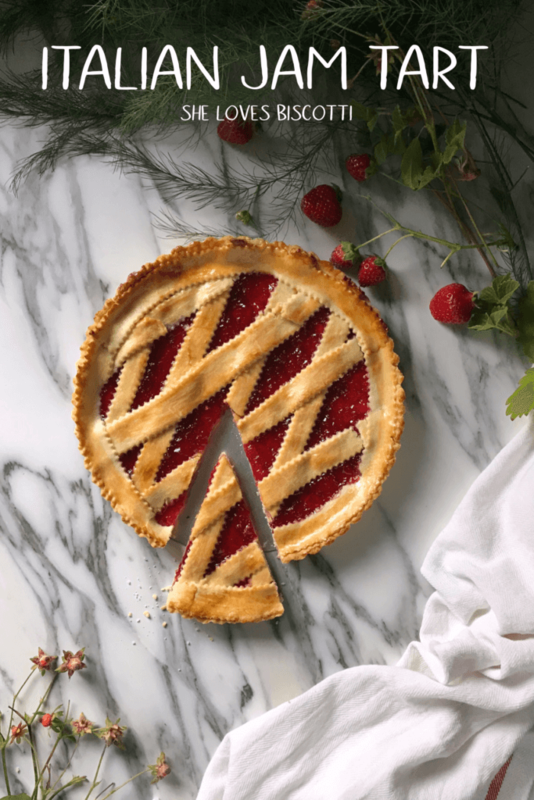 If the crust is too thin, the whole crostata just falls apart when slicing it. Ideally, the dough should be rolled out to ¼ (or slightly thicker) inch thick. If you recall, when we made this Triple Berry Crostata, there was no pan used -it was a free form pie. Today, we will be using a fluted tart pan with a removable bottom. But don‘t worry, it‘s just as easy. Are you ready? 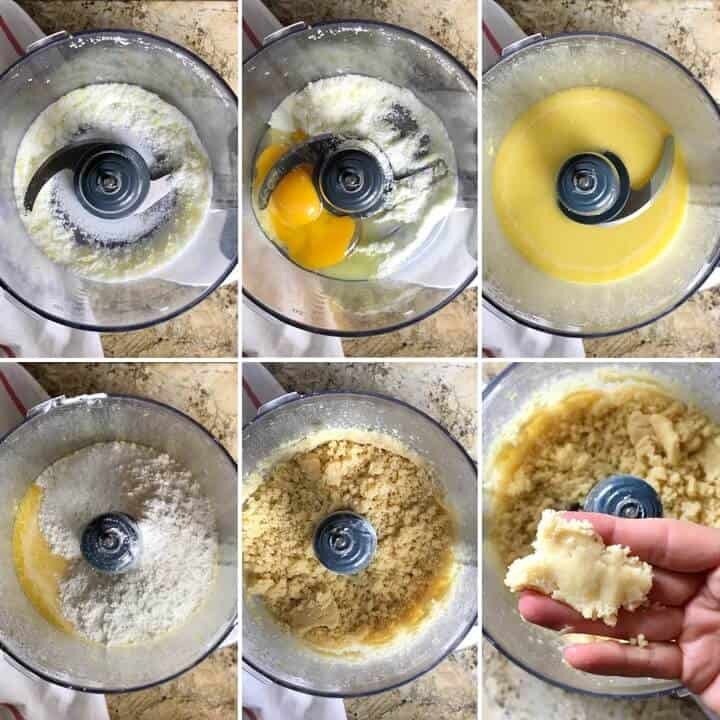 Crostata dough: This no butter dough comes together in no time in a food processor. Simply pulse together the lemon zest and sugar in order to release some of the oils from the zest. Can you begin to smell the citrus freshness? Next, add the whole egg and the egg yolk and give it a whirl for 20 seconds. The safflower oil is added next and once again, process for 15-20 seconds. It is now time to add the dry ingredients -so the flour, baking powder, and salt are pulsed with the liquid ingredients. It should take about 10 pulses or until the mixture resembles coarse breadcrumbs. The dough should stick together when gently squeezed. Transfer the dough to a wooden board which has been lightly floured. Gather the dough together and form a log. Just in case you are wondering, this dough requires no kneading. Divide into two balls -one about 2/3 of the dough which will form the bottom layer of the crostata and the other 1/3 will become the top. Wrap in plastic wrap and refrigerate for at least 30 minutes. Roll out the larger piece of dough to fit your 10” tart pan. 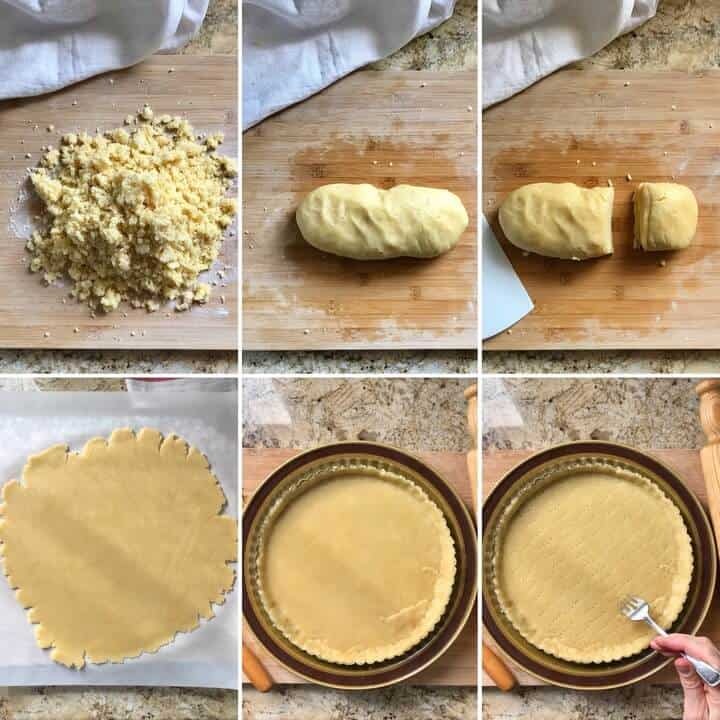 In order to facilitate the transfer of the dough to your tart pan, roll out the dough between two pieces of parchment paper. Slide the parchment paper (and the dough) on a cookie sheet and place in the refrigerator while you roll out the smaller piece of dough that will form the lattice top. Once again, transfer to a cookie sheet and place in the refrigerator. Pull out the first piece of dough. With the times of a fork, simply prick a few holes in the base of the crust. The jam: Today, I am using my strawberry jam, feel free to use your preferred jam. Spread a thin layer of jam over the bottom part of the dough, about ¾ cup. Pull out the smaller piece of rolled dough from the refrigerator. Cut into strips, about ½ inch, with a pastry wheel, arrange over the jam. Start by placing the longest strip straight across the middle, followed by one or two strips on either side. This will form your bottom layer of strips. Then, criss-cross with 4 more strips. If you still have dough, you can cover the sides with it. Gently press together, securing the side ends to the bottom crust. Brush a little of the egg wash over your lattice work (NOT the jam). Bake in a 400° F oven for about 30 minutes (in bottom third of the oven) or until the crust is golden brown. if your dough cracks or breaks, just patch it up with another piece of dough. You need to work quickly when handling this dough. My parents had the most wonderful fruit trees growing in their backyard -peaches, Italian prunes, pears, apples. As a result of this overabundance of fruit, my mom would try to preserve them by making fruit jams and compote… and more often than not, a crostata was sure to follow. Unfortunately, there were no measurements to my mom‘s crostata recipe, only ingredients. So, I based myself on Carol Field‘s (The Italian Baker) Pasta Frolla (version 1). Since my mom rarely baked with butter, I replaced the butter with a safflower oil and I decreased the total amount of sugar as the strawberry jam I make is sweet enough. Some other changes that I will sometimes make is replacing the vanilla with Grappa and using an egg-wash to give the crostata a little more color. 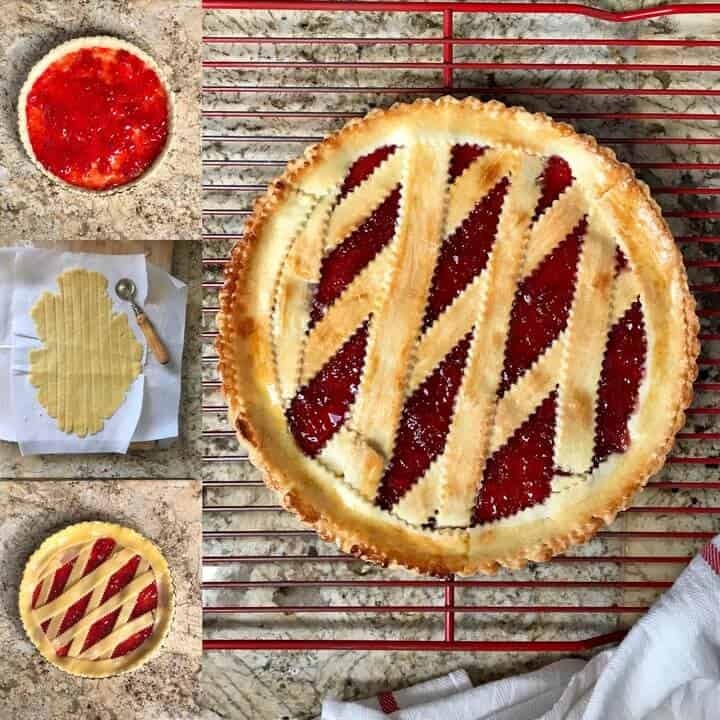 Needless to say, there are infinite variations that can be found in any cookbook or online when looking for a pasta frolla recipe in order to make a jam filled crostata. In my humble opinion, the best recipes are usually the ones we grew up with. Often times, it isn’t even the actual recipe that we are trying to replicate, but that special connection shared with loved ones, to a time and place in the past. This Italian Jam Tart is meant to be rustic and imperfect. Yes, the dough will tear, but it can just as easily be patched up. The best part is that no one really cares because it tastes really good. This Crostata di Marmellata can be part of a decadent breakfast or a special treat at the end of a meal. There really is something to be said about simple foods that provide us with uncomplicated flavors. 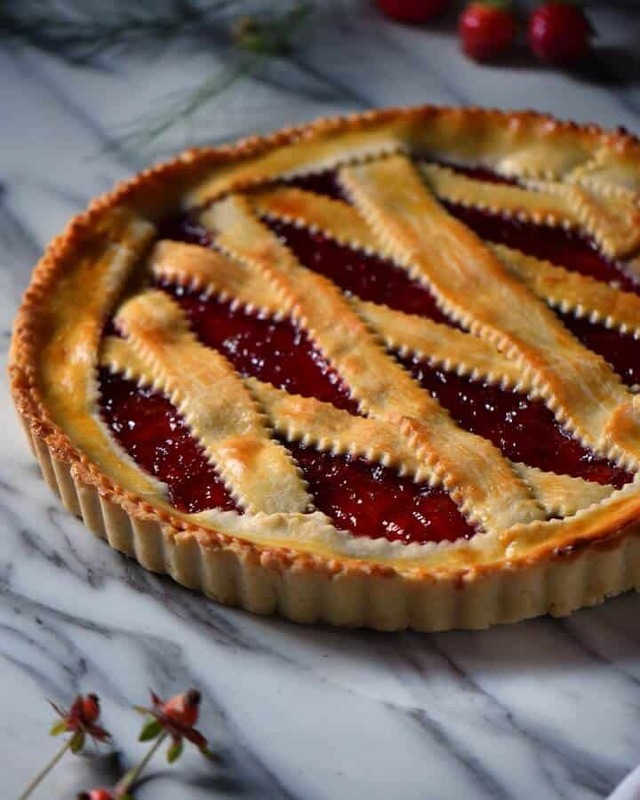 ★★★★★ If you have made this Italian Jam Tart recipe, I would love to hear about it in the comments below and be sure to rate the recipe! In a food processor. pulse together the lemon zest and sugar. Add the whole egg, the egg yolk and vanilla extract. Give it a whirl for 20 seconds. Next, add the safflower oil and process for 15-20 seconds. Add the dry ingredients (flour, baking powder, and salt) and pulse together until the mixture resembles coarse breadcrumbs. The dough should stick together when gently squeezed. Place oven grate to bottom third of the oven. Preheat oven 400° F.
Roll out the larger piece of dough to fit your tart pan. In order to facilitate the transfer of the dough to your tart pan, roll out the dough between two pieces of parchment paper. Quickly flip the dough and the parchment paper over the tart pan and slowly peel back the parchment paper. Press dough into the edges of the pan. If the dough breaks (like mine) simply use the scrapes of dough to patch up. Spread a thin layer of jam over the bottom part of the dough. Pull out the smaller piece of rolled dough from the refrigerator. Cut into strips with a pastry wheel, about ½ inch, and arrange over the jam. Start by placing the longest strip straight across the middle, followed by one or two strips on either side. This will form your bottom layer of lattice strips. Then criss-cross with 4 more strips. If you still have dough, you can cover the sides with it. Gently press the sides together, securing the ends to the bottom crust. Bake in a 400° F oven for about 30 minutes or until the crust is golden brown. Allow to cool completely before removing form the tart pan and serving. Hi Maria, thank you for this wonderful recipe. I made this recently and it is so easy to follow instructions and to bake and absolutely delicious, one of the best I’ve ever tried! I am making it again for the holidays and can’t wait for friends and family to try. It is going to be my new go to dessert. I used olive oil (about a cup works) which I like to use in place of butter and was so happy to find a recipe that works so well with oil. Thank you again! Wow ! 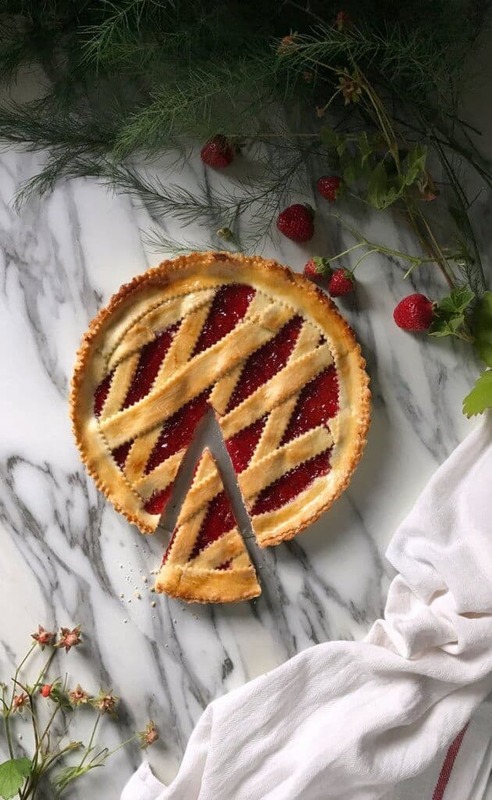 I make crostata quite different than this one but this is something that I must do ! Grazie milla ! My pleasure you guys! Enjoy 🙂 Appreciate you dropping by, thanks! Maria your instructions are right on target with this one, as usual – the BEST quality jam is essential, why bother otherwise. Ratio of crust to jam, fundamental. The crostata looks picture perfect, I wish I could have a slice right now. It looks gorgeous, Maria! Nothing beats a homemade crostata with homemade jam. And this one, with oil, instead of butter, is my mom’s favorite and the one I make when I’m with them 🙂 . Outstanding job, as always! Maria, the tart looks beautiful… Can’t wait to try it especially since we’ve still got plenty of homemade strawberry jam. You will love it Louise ♥ Thanks so much for stopping by 🙂 Have a great week-end! Same to you, Maria. I must admit that I was refreshing almost daily for another one of your lovely desserts. Not to say that I didn’t enjoy reading about the other recent recipes. In fact, I’m planning on making that eggplant caponata tomorrow. Thanks so much for your support Louise ♥ I have so many wonderful recipes -I can`t wait to share! Maria, I was wondering if it would be alright to leave the dough over night in the fridge? Update: So, I tried refrigerating the dough this week-end… the dough kept breaking as I was rolling it out, so a lot of patchwork. The taste was good, the look was fine. Would love to hear about your results if you do decide to try it. It was a fun experiment Louise 🙂 Hope you have a great week!